Historic adventure by Land Rover in Oman. Richard Hobby recalls some of his favourite Land Rover memories. 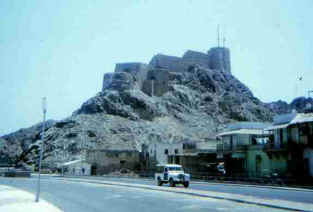 Oman, a land of history and empire had by 1971 become an isolated land of mystery. A land of vast desert, and soaring mountain. At that time the present Sultan Qaboos ousted his father to guide his country into the 21st century. 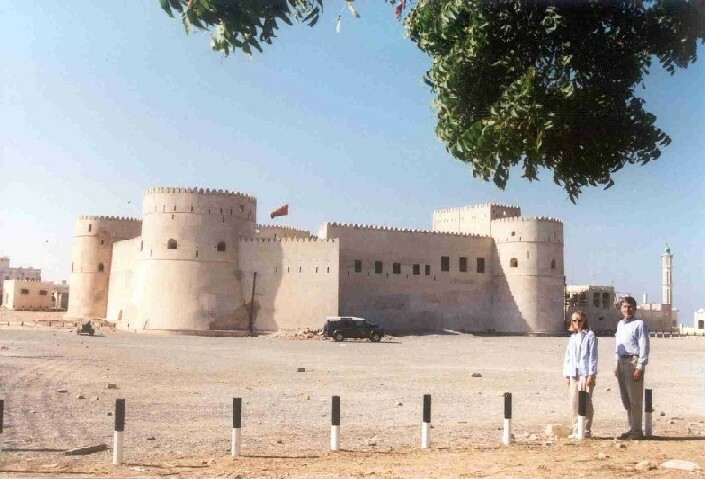 Oman's military was fighting a forgotten guerrilla war in the southern province of Dhofar aided secretly by Britain and other nations including Iran. It was a country with just a few miles of asphalt. Elsewhere poor gravel roads or tracks served to connect this enchanting land. Perhaps more was carried by camel than wheel. Roads were very hard on vehicles. Ties to Britain, and Japans emergence as an automotive super power yet to come, made Land Rover the obvious choice for mobility. Might one suggest Oman was rebuilt by Land Rover? I was first privileged to visit Oman in 1973 when there were just over 12,000 vehicles registered. Our VW was number 12346. These were mostly new since 1971. Land Rover dominated in government service. The civil sector comprised Brazilian Volkwagen's, the emerging Japanese influence and Land Rover. Any journey beyond the capital region of Muscat was best undertaken by Land Rover. With links to the rapidly expanding communications sector, my family had access to a blue Land Rover SIII 88" station wagon for the more adventurous trips. 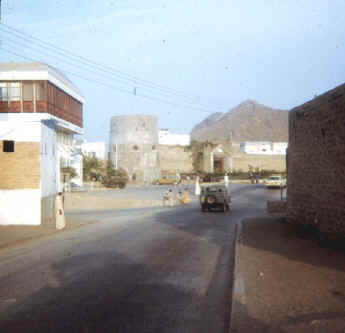 Prior to our sojourn in Oman my father had described an adventure by Land Rover through the mountains to Fujairah. Land Rover was the way to go overland. So my first chance at a long range Land Rover adventure was an exciting prospect. A day trip to Sohar the legendary home of Sinbad. Two Land Rovers made the trip. Communication links were vital to the emergence of the country into the twentieth century, our expedition set out with this aim. A limestone coloured SIII 109" truck cab carried supplies and the blue SIII 88" the crew. Beyond the new international airport at Seeb the tarmac road ended, dropping the adventurer on to the gravel of the wadi dissected coastal plain. To the West the interior and the mountains. The Gulf of Oman to the East. 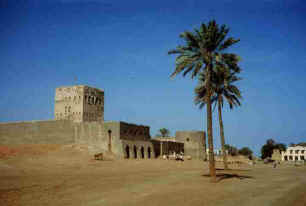 North, the dirt road to Sohar through date groves and agricultural enclaves steeped in history. Portuguese conquest, maritime supremacy and trade, smugglers and slavers, the daily lives of fishermen, caravaneers and agriculturalists through thousands of years. Seemingly little had changed apart from our route across the country. Three hours of jarring corrugated highway. 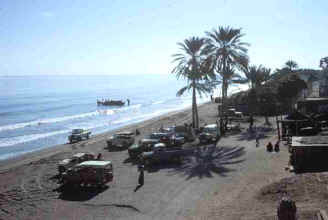 Sohar, dominated by its large fort swelters on the shore of the Indian Ocean. A wide tidal beach where dhows would land their cargoes, off loaded on the backs of sinewed porters into seemingly ubiquitous ex-military and truck cab Land Rovers. 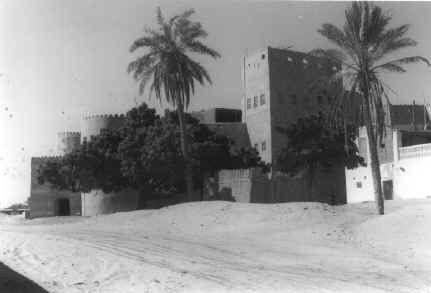 Imported goods and food for the souks of Sohar, the towns and villages of Oman and the Arabian hinterland. We returned to Muscat in the late afternoon, a long dusty drive chasing dust plumes in the shadows of the Jebel Ahkdar mountain range that reach to 10,000 ft. In Muscat, Police Santana's cruised beside new Volvo station wagons. The Santana's resulting from an embargo placed against goods sold to Israel after the 1967 war. Solihull supplied Israel, Santana supplied Arabia. Climbing aboard a military Land Rover I learnt to my own discomfort that they were camouflaged with a layer of sand thrown over wet paint. An interest in ex-military Land Rovers emanates from such beginnings. Three years later I returned to Oman. Proclaimed jubilation, (a 5 day national holiday), for the end of the war in Dhofar delayed my family's entry to the country. The dangers of travel in Dhofar still existed. The final defeat of the rebels came six months later. The military was much in evidence and Europeans might still carry a gun outside the security fenced urban centres. Frustration still boiled among certain factions. Two years later 13 British workers were gunned down at a weekend beach party. 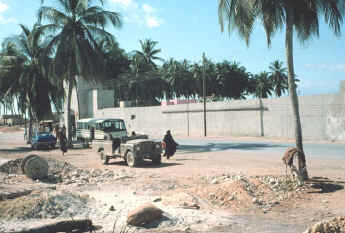 Salalah, beside the palm fringed Indian Ocean was until weeks before, an armed camp. Boys, hardly taller than their weapons guarded palaces with ancient Lee-Enfields. Land Rovers bore the troops of a number of friendly states including Iran. In the market place, under the palms beside the city gate, Datsuns, Toyotas and Power Wagons intruded in Land Rover's one time enclave. Still the white and blue Police Santana's cruised among military and civil products from Solihull. Another visit to Oman was to be the adventure of a lifetime. Driving Land Rovers in the hostile reaches of the desert for six months. Petroleum Development Oman, the nations oil producer, my employer. As a surveyor in PDO's Exploration Topographical (XT) department I was to see parts of Oman many visitors may only imagine. Upon arrival in the interior by air I was collected by a Land Rover 109 station wagon. It was parked among the many uniformly painted vehicles at the airstrip, all the products of Solihull. I suspected that PDO was the worlds largest non military fleet user of Land Rover products. Each vehicle had an air identification number painted on the roof, the number repeated on the sides and many carried radios. This was Land Rover country. An 800km stretch of empty desert populated by a few oil camps. Our vehicles were all specially equipped for desert travel. 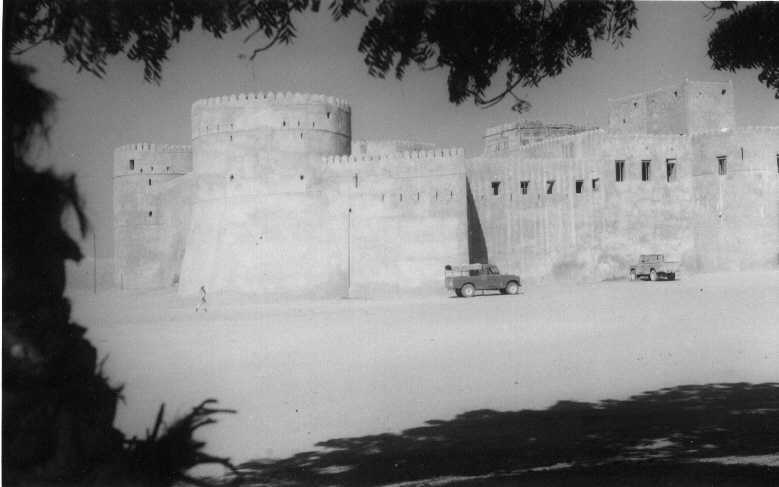 Each had two spare tyres, perhaps three, a built in water tank, sand tracks, roll bar, pick, shovel, sledge hammer, trowel, a rack for survey tripods as well as the survey equipment needed for locating oil wells throughout Oman. A daily supply of water, a bag of cement, steel pipes, and old oil drums for survey markers would be loaded up before heading out. Personal 2 gallon water coolers and bog roll completed. In addition two radios were fitted to most vehicles. Radio checks were carried out daily with our base in Muscat. The logistics of the work required a team of three vehicles for each days work. It would be a rare event that would find us stranded in the depths of the interior. Shell's 1973 road map shows repeated warnings that "a guide is required for all journeys in the interior". By 1982 oil supply roads formed a basis for desert navigation. My second day brought disaster. We did not wander off on some lost direction to be searched for by air for two days like a pair that came later*. In a featureless land under a tropical midday sun an easy feat. Our misfortune occurred when trying to overtake a "rig move", and was due to the hard knocks Land Rovers suffer at work. Our companions returned after missing us a few miles up the road. All the equipment was removed from our vehicle and returned to base with four crew aboard one Land Rover. Two of us remained with one spare vehicle under the blazing April sun, awaiting recovery summoned by radio. Five hours later a Bedford 3 tonner with a HIAB crane plucked our truck cab SIII from its grave. At PDO's Land Rover repair centre in Marmul we last saw it in pieces under going a major rebuild. A new vehicle was issued. At six months a PDO XT Land Rover was an old vehicle! 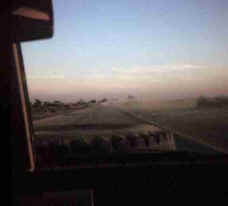 Mute testimony to the dangers of driving in dust plumes stood at the entrance to Fahud oil camp. A retired grey XT 109 stood on a plinth, its back broken and cab squashed by the impact. The only safe way to pass a slower plume, wait for the vehicle in front to move over allowing passage on the windward side. Passing oncoming vehicles was a heart stopping moment. Ignoring the danger lead to a horrific collision in which 16 died. Hundreds of kilometres from any help. Much of our work was setting control for seismic surveys. Our team would be attached to one of the mobile camps. A self contained housing and maintenance base for the geology survey company. Their mission to find oil. Passage of their search (or any other vehicle) scars the face of the baking desert for decades. Setting control points around a seismic survey area might mean scrabbling over the boulder scree of a mountain side, or plowing through wind blown sand so soft you dare not change gear for fear of becoming a feature of the landscape. The northern edge of the Jiddat al Harasis plain is bounded by the Rub al Khali sand sea on the west and the Green mountain, Jebel Akhdar, on the north. To the east, the Wahiba Sands, said to be impenetrable mountains of sand. Flash floods from the Green mountain drain west to soak into the desert sand. Surprising swathes of green line the wadis supporting wild life of many kinds. The Oryx, thought at one time to be the legendary Unicorn was hunted to the brink of extinction, now guarded by their former hunters. Gazelle who seemingly appear from nowhere as they move from camouflaged safety to panicked flight. In camp near the Jebel Mandan we learnt of the existence of a large ten legged arachnid. As the sun set on the flat western horizon these creatures could be seen scurrying in to camp. Meet the Camel "spider", a ten legged solifugid carnivore that feeds on large mammals. Injecting an anesthetic it slowly digests the flesh of its victim leaving camels, goats, and horses lame. In our dining tent their resourcefulness was revealed as one dropped from a vent, scattering diners. Scorpions and snakes added to our evenings. In the depths of the desert our fuel was supplied by the nearest oil camp. Auxiliary fuel tanks added to our endurance. In one instance the scree took its toll. Running dry early, the main tank had to be investigated as a matter of survival. This was an instance where the ruggedness of Land Rovers was to be questioned. We were in rough terrain admittedly and the vehicle might have been better prepared. Why was the fuel tank guard spot welded to the tank? It had literally leaked like a sieve. At least ten spots had torn. The spare tank was sufficient for our daily needs, so we carried on with the main tank removed. In a very short time our fleet of three Land Rovers had suffered six punctures. The new Land Rover was the last to get one. All on tubed tyres. Our usual equipment lacked repair parts as we could expect to make it in daily to get work done. Six flats in two days was a bad stretch, usually we could rely on our host camp to repair the odd flat. One Land Rover set off without a spare on a 200km drive to the nearest base at Fahud. In the desert we worked every day. Days off meaningless. Fahud was on weekend, the garage closed. Six wheels were borrowed from other PDO Land Rovers and notes left on windscreens. Back to the desert. By Land Rover we had access to most hilltops. One defied access. A vertical volcanic dyke hosted a survey marker. The truck was parked under a tree at the base and the equipment carried to the top in two hauls by one person. Battery failure required that part of the Land Rover to be hauled to the top too. Without the vehicle or its battery, communication by radio or via the distance measuring microwave was a long wait and caused concern for other team members. After the measurements were taken an exhausted and waterless surveyor was rescued from the hill top. His distress compounded by pumping water irrigating a nearby field. A surprising sight after a long traverse in rocky desert punctuated by wadi, black lava fields and acacia tree. On this occasion we were stricken down to seven serviceable tyres on two vehicles. Two hours for a round trip to get two spares repaired. A good book was always handy! At Yibal, a desert oil camp, the entertainment one evening was struck by a freak summer storm. Dust devils and rain combined to throw sand on our barbecue. Hardy desert dwellers all, we partied on. Driving our Land Rovers back to camp between the oil pipelines for which we were there. North toward the fabled town of Buraimi we traveled to Lekhwair. In the sand desert we found an old airstrip, its runways kissed with the green of new grass in July. Searching for our target we aware of two Toyota Land Cruisers shadowing us 2km away across the border. Saudi Arabian border guards must listen in to early morning radio checks! Radio support was useful, however it was sometimes necessary to confirm data by phone in light of the sensitive nature of our work. Opportunities to visit town were rare. Nizwa offered a public phone and the chance to savour the alleys and palm groves of historic Oman. Communities had their share of project vehicles. Land Rovers stripped for useful parts stood on precarious rock piles, awaiting the day they might be reassembled. In one a cylinder block open to the elements was split expansively between cylinder 2 and 3. For other parts, Land Rover heaven, use on another Land Rover. Perhaps old Land Rovers never die they just fade away. After living out of the back of Land Rovers for six months, you will understand how it was that I took some sand home with me. Would I return? In an instant. All photographs copyright R. Hobby collection.